Table 1. Li 1s values from a compilation of literature sources . Table 2. 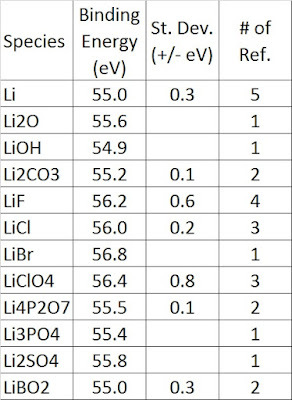 Li 1s values from standard run in this laboratory . Lithium is quite reactive to air and water exposure, the use of gloveboxes is important here. F 1s in LiF = 685.5 +/-0.7 eV (7 references), 685.1 +/-0.1 eV (standard samples from Table 2). O 1s in Li2O = 531.3 eV (1 reference). O 1s in LiOH = 531.2 +/-0.2 eV (2 references). O 1s in LiCO3 = 531.5 +/- 0.1 eV (2 references). Cl 2p3/2 in LiCl = 198.6 +/- 0.1 eV (standard samples from Table 2). 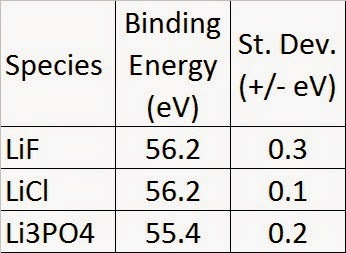 O 1s in Li3PO4 = 531.3 +/- 0.1 eV (standard samples from Table 2). P 2p3/2 in Li3PO4 = 133.3 +/- 0.1 eV (standard samples from Table 2). M.C. Biesinger, A.R. Pratt, unpublished results (2010).